LINCOLN — Nebraska environmental regulators want public input on how to spend more than $12 million the state will receive as part of a federal air pollution settlement with Volkswagen. Gov. Pete Ricketts has told the Nebraska Department of Environmental Quality to develop a plan for using the money to reduce levels of nitrogen oxides in the air. The department, in turn, is seeking public comment on how to develop the plan and fund projects across the state, according to an agency press release. Continue reading. Visit the Nebraska Department of Environmental Quality (DEQ) web page for more information about the VW settlement and to download the Request for Comment on VW Mitigation Plan Development (PDF). 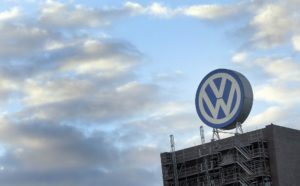 Associated Press Photo: Nebraska will receive $12 million of the $3 billion federal air pollution settlement with Volkswagen. This entry was posted in Nebraska / Midwest News, NewsBlog and tagged Nebraska Department of Environmental Quality (DEQ), VW Mitigation Plan Development on September 22, 2017 by Helen Deffenbacher.